The premise sounds creepy, but is actually very intriguing and enchanting when you're reading about it. Readers will also realize there are more secrets about these dolls than Cassedy is letting on. We see Maggie grow from a distant, upset little girl into a more loving, caring, and open young person. 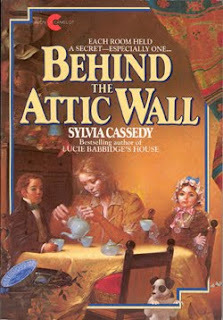 The ending of Behind the Attic Wall will make readers cry as we put the mystery behind the dolls in the attic wall altogether. This was one of my favourite books as a child. At 29, I just ordered it and reread it. It is still as haunting, beautiful and enchanting as it was the first time. A great read that stays with you forever. Haha! I am 29 too, and I read it OVER and OVER again for years. Funny...I also re-ordered it in my adulthood. It stays in my permanent collection now!